More than 2,000 Arriva North West bus drivers and engineering staff are taking industrial action in protest over "pitiful" pay offers. Members of the Unite and GMB unions are involved in the 24-hour strike which began at 03:30 BST and will continue until Friday. It is the first of three planned days of action, with further walkouts scheduled for Arriva on 23 and 30 October. Arriva said its pay offer was "fair". Talks broke down last week after the company's latest pay increase offer of 31 pence per hour was rejected by a joint union ballot. GMB said this was a "real terms pay cut" after inflation hit 3%. 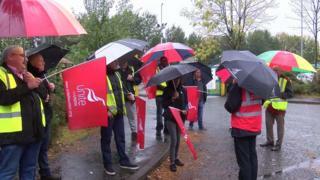 Unite said it wanted an "equitable pay award" across all depots and for Arriva to tackle wage inequalities of up to £1.73 an hour between bases. Arriva North West said it wanted to wholeheartedly apologise to customers for the "unnecessary" strike. Arriva tickets will be accepted on Stagecoach services including: 10A, 14, 53, 82, 86, 471 and 472. Roads, tram and rail services are expected to be busier than usual. Check the Arriva website or Twitter before you travel for the most up to date information. Journeys between Liverpool Central and Liverpool South Parkway between 07:00 and 09:00 and 16:00 and 18:00. Check here for route options. For details of times and other bus and travel services visit Merseytravel or Transport for Greater Manchester. What about using the roads or railways? Further strikes are planned for 23 and 30 October. Unite regional officer Neil Clarke said: "All we are seeking is a fair and reasonable pay award against a backdrop of spiralling inflation and soaring living costs. "Our members are fed up with pitiful pay offers and Arriva's 'pick and mix' approach to wages where some depots get a pay rise and others don't. "This has resulted in wage inequality across a number of depots and is in stark contrast to the company's claim to be an industry leader in the treatment of its workforce." Phil Stone, managing director for Arriva North West, said it was "disappointing" after two improved offers the unions were "proceeding with disruptive strike action" adding that any pay increase must be "sustainable" for the business. "We are urging our trade union colleagues to reconsider their position and get back round the negotiating table and call off the strike action that will unnecessarily disrupt many thousands of passengers," he added. Eddie Parker, GMB regional secretary, said commuters should be aware of "potential traffic chaos". "No-one wants to go on strike and our members are taking industrial action as a last resort," he said. Let us know how the strike affects you. You can contact us on Twitter @BBCNWT.